We’d love your help. 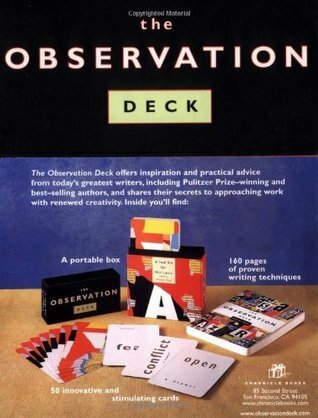 Let us know what’s wrong with this preview of The Observation Deck by Naomi Epel. To ask other readers questions about The Observation Deck, please sign up. I assume that this book is supposed to come with a deck of cards, but my copy was from the library. The idea is that you draw a card from the deck to jump-start writing and inspiration and story-telling, but I had no cards. As I begun working my way through all of the sections of the book explaining the techniques, I decided that it would be worth my while to make my own (and that this was actually more helpful than just buying premade cards). Cut to several hours later and I have turned a rando I assume that this book is supposed to come with a deck of cards, but my copy was from the library. The idea is that you draw a card from the deck to jump-start writing and inspiration and story-telling, but I had no cards. As I begun working my way through all of the sections of the book explaining the techniques, I decided that it would be worth my while to make my own (and that this was actually more helpful than just buying premade cards). Cut to several hours later and I have turned a random pack of casino playing cards* into my own observation deck. On the backs of my playing cards, I wrote the prompts in sharpie, and on the face of the card I wrote helpful hints to remember what the instructions were for that particular prompt (since, in theory, I have to return this book to the library). In addition, I have decided to make another deck for pearls of wisdom I find in other books. Cut to the me of six months ago scoffing at the thought of "reading books about writing" to find inspiration. Cut back to the me of the present who has 5,000 words of a novel, which is not nothing. I love the interesting perspectives and the "pick a card" option. In addition to the cards in the box, there is a small book that explains each one more so you can understand how to fit the technique into your work. I really enjoy brainstorming different ideas when my interest is waning in something I'm working on. I deduct one point for the sloppy editing. At one point she talks about the town where "In Cold Blood" took place, calling it "Hokum, Kansas." Seriously? Anyone who knows this topic k I love the interesting perspectives and the "pick a card" option. In addition to the cards in the box, there is a small book that explains each one more so you can understand how to fit the technique into your work. This isn't a book, but a deck of cards *and* a small guidebook. Taken together, the kit is intended to help writers find inspiration and overcome writer's block. I'd recommend it as a tool of the trade for any fiction writer. I rate it 4/5 because in my personal opinion, while most of the cards are very good, some are just so-so. This book comes with a deck of cards. Each card contains a writing idea that corresponds to a chapter in the book. The book can easily stand on its own without the cards (that is, it can be read straight through or you can turn to a random page, rather than drawing a card). The ideas are good, but nothing I've never heard before. An interesting list of ideas to get you going on your writing or to get you through a block but nothing earth shattering. Now I'll try some of them out and see how they work. I'm not sure how to mark progress in this book. It's more a reference book with an accompanying deck of cards, designed to keep writers writing. I may read the book cover-to-cover, just the same. Most useful suggestion was to open a drawer and write about what was in it. Otherwise, a little generic. The book that comes with this is quite good, but I never use the card deck.